The fastest production estate car in the world. Has a nice ring to it, doesn't it? The Audi RS4 was a car that would leave a McLaren F1 floundering in its wake from the lights yet could still carry a family of five and their luggage up a snowy pass. The ultimate driving machine? No. With too many flaws in its dynamic makeup, the RS4 never garnered widespread critical acclaim, but as used examples trickle onto the market it is becoming an interesting and supremely practical way to paddle supercar behind without losing your shirt. Built by Quattro GmBH in Neckarsulm at a factory quite separate from the common-or-garden Ingolstadt Audis, the RS4 was the spiritual successor to the 315bhp RS2, a car that was developed as much by Porsche as by Audi and had been a minor hit in the early nineties. With 380bhp at its disposal from a twin-turbocharged 2.7-litre V6, the RS4 majored in brute force. It was introduced in early 2000 to a disbelieving general public who soon realised that here was a car that was quicker than a Porsche 911 for £13,000 less and which could act as something more than an extravagant plaything. The RS4 sold well, but was later dogged by accusations that the alloy wheels could distort, leading to potentially dangerous blowouts. 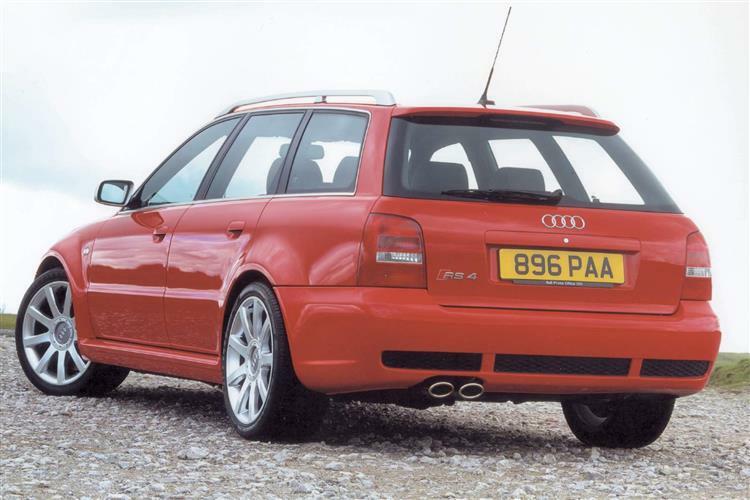 Audi UK even staged an event in October 2001 at Millbrook test track where an RS4 was driven at high speed over concrete blocks without the wheels failing and went to the effort of offering alternate rims for anybody not satisfied with the results of the demo. Sales of the limited run RS4 finally ended in early 2002. The RS4 is a car you could leave anywhere without a backward glance. At first glance, it looks exactly like any other up-market A4 Avant - its biggest virtue or its greatest drawback, depending on your perspective. Only on closer inspection do the differences make themselves apparent. Three huge air inlets dominate the bottom of the front spoiler - nor are they simply there for show. The middle vent cools water and oil, while the other two channel air to each of the turbochargers. The wheelarches feature 35mm flare extensions and there's beautifully contoured skirting to link them together. The wheels wear 18 inch 9 spoke alloys with 255/35 ZR18 rubber. Behind are huge ventilated disc brakes that decelerate from 62-0 mph in just 2.5 seconds: so make sure your belt's done up tightly. Badgework apart, other giveaways include three further vents in the rear bumper, aluminium for the door mirrors and front grille surround, plus matt alloy roof rails. Conceivably, you might also notice that this car rides 20mm lower than an ordinary A4. Inside, the effect is equally as laid back - though this is clearly a cockpit designed for serious driving. Leather-clad Recaro sports seats are beautifully supportive and the chunky three-spoke hide-trimmed wheel feels good to hold. As you'd expect from a car costing £9,000 more than the already pricey 265 bhp S4 Avant, almost everything you'd want is fitted as standard, including a wonderful 170 watt Bose stereo system. On the safety front, Audi's 'Sideguard' system is standard, a head-level airbag contained within the roof lining. Stretching the length of the cabin, it aims to prevent head injuries in side impact or roll-over situations and works in conjunction with the front and side airbags located in the front. As for practical virtues, well there is, after all, 390 litres of loadspace (which rises to 1250 litres up to window level when the split rear seats are folded flat). Certainly enough for the skis, tennis bags and canine companions that constitute all most owners tend to want to carry. Moreover, the space on offer is also very user-friendly. Neat touches include metal rings in the boot floor for tying down smaller objects, and recesses in the side panels. Audi also provides a rattle-resistant boot cover incorporating a dog net. But you won't buy an RS4 for its practical appeal. It's hard to think of any other car that could rush you front point to point on any roads in any weather quite as quickly. Despite Audi's protests to the contrary, many owners have discovered wheels slightly out of alignment, so a pre-purchase check may be required. Hard driving also shows up a weakness in the braking system, with track use warping the brake discs. This will manifest itself in a juddering of the pedal under braking, much as if the ABS has cut in. Check the tyres for wear as these will be costly. Otherwise, the impeccably screwed together RS4 should be a less temperamental partner than any other 170mph vehicle you can imagine. (approx based on an 2001 RS4) A clutch assembly kit will be around £225 and an alternator should be close to £175 and a radiator around £180. Front brake pads are around £70, rear brake pads will be £45, and a starter motor close to £165. The RS4 is all engine. OK, so it's basically the same Bi-turbo 2.7 litre V6 used by the S4, but an extended visit to Audi-owned Cosworth Technology has changed it almost out of all recognition. The four-cam V6's 141 bhp per litre figure is claimed by Ingolstadt to be the highest for any production engine. Though its roots lie in the old RS2's 315 bhp in-line five cylinder engine, this powerplant is a work of art in its own right. The crankshaft, conrods, block and pistons have all been reworked, while bigger KKK K04 turbos replace the smaller K03 units used on the S4. As a result, maximum turbo boost is up from 1.9 to 2.2bar. This is an engine that provides an immensely usable spread of power. Astonishing torque figures promise instant acceleration at any time in any gear. Even at 120mph, you can expect the car to surge forward as if drawn towards the horizon by a powerful magnet. That 155 mph top speed is artificial by the way. Owners report achieving 165 mph and without interference, over 180 mph would be easy. 60mph is a mere 4.7 seconds away. You can't simply add this much extra power without changing the steering and brakes. Hence the new hydraulic pump for the power steering and those huge ventilated disc brakes mentioned earlier. Would that equal effort had been expended on the gearbox: as with the S4, this is one of the most disappointing parts of the car, with a lifeless feel to the change and a long travel across the gate. According to Audi's technical people, the engine develops so much torque that they couldn't find an automatic gearbox capable of taking it. This is one reason for a slightly heavy clutch which, for the uninitiated, can make the change from 1st gear to 2nd somewhat jerky. You certainly don't feel like flicking up and down the 'box for the sake of it. Handling is super secure, the RS4 unwilling to play fast and loose, but at the same time there's that characteristic Audi feeling of deadness in the steering and little feedback transmits back through the chassis. Despite its leviathan pace, the RS4 isn't as much fun as an E46 series BMW M3. But then it is an estate. The Audi RS4 was a lot of car for the money when new, and despite its meagre depreciation, it's an even bigger bargain used. For peace of mind, if nothing else, many owners will change the wheels and it's worth upgrading the brakes if you're looking to boost ultimate capability. The experience of catapulting an RS4 off the line is worth the price of admission alone. Get saving.